WASHINGTON – President Donald Trump tried to play it both ways on climate change in describing a warming-but-cooling planet Earth. The unequivocal response, according to data and climate scientists: wrong. The president’s claims about ice caps, from an interview heard Sunday on Britain’s ITV News, also were off the mark. TRUMP: “There is a cooling, and there’s a heating. I mean, look, it used to not be climate change, it used to be global warming. That wasn’t working too well because it was getting too cold all over the place.” – ITV interview. THE FACTS: That simply doesn’t fit with the science. The world hasn’t had a cooler-than-average year since 1976 and hasn’t had a cooler-than-normal month since the end of 1985, according to more than 135 years of temperature records kept by NASA and the National Oceanic and Atmospheric Administration. The last four years have been the four hottest years on record globally, with 2010 the fifth hottest year, according to NOAA. Every year in the 21st century has been at least three quarters of a degree (0.4 degrees Celsius) warmer than the 20th century average and in the top 25 hottest years on record, NOAA records show. And while a good chunk of the United States had a frigid snap recently, most of the rest of the world was far warmer than normal, according to temperature records. TRUMP: “The ice caps were going to melt, they were going to be gone by now, but now they’re setting records. They’re at a record level.” – ITV interview. THE FACTS: It is a bit more nuanced, but not quite right. While a small number of experts a decade ago had predicted that Arctic would be free of summer sea ice by now, most mainstream scientists and the United Nations’ Intergovernmental Panel on Climate Change did not; instead they said Arctic sea ice would shrink, which it has, said Pennsylvania State University ice scientist Richard Alley. Most scientists, including the director of the National Snow and Ice Data Center, are predicting that the Arctic will be free of summer sea ice sometime around the 2040s. The Arctic set a record for the lowest amount of sea ice in the winter, when sea ice usually grows to its maximum levels, in March 2017. 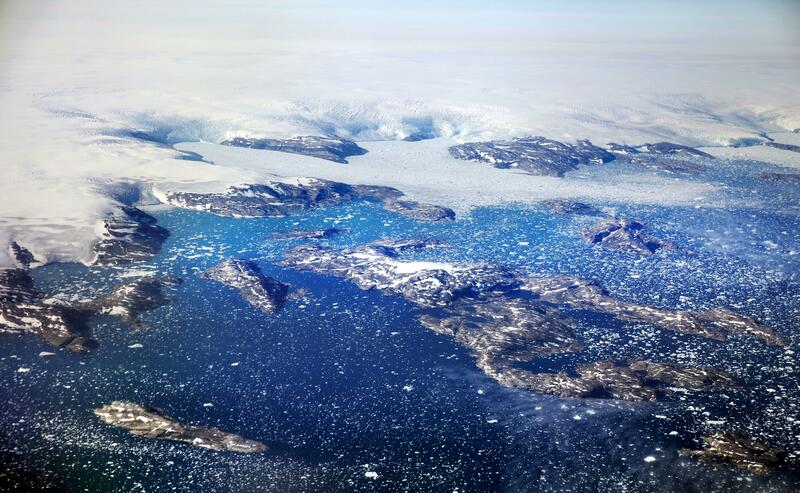 In 2012, the Arctic set a record for lowest sea ice levels. Sea ice recovered slightly from that record and in 2017 in September, the annual low was only the eighth lowest on record, according to the National Snow and Ice Data Center. But the 10 lowest years of sea ice have been all in the last 11 years. Arctic sea ice is declining at a rate of 13.2 percent per decade, according to NASA. Princeton University climate scientist Michael Oppenheimer said the Antarctic sea ice pack, less directly influenced by global climate change, varies from year to year. Antarctica hit a record low for sea ice in March 2017, the same month the Arctic hit a record winter low. Antarctic sea ice also reached a record high in 2014. TRUMP: “After years of stagnation, the United States is once again experiencing strong economic growth.” – Davos speech. THE FACTS: The economy is doing better by some measures but data released right as Trump finished speaking shows it hasn’t yet accelerated meaningfully since his inauguration. Since the Great Recession ended in 2009, the economy has expanded at an average annual pace of 2.1 percent, which makes it the slowest recovery since World War II. The Commerce Department said Friday the economy grew 2.3 percent in 2017, Trump’s first year in office. Most economists expect better in 2018. But the United States hasn’t yet entered a sustained period of faster growth. Trump was gunning for 3 percent or better, and confident about his chances. He reached that goal in two quarters and frequently pointed out that President Barack Obama never saw 3 percent growth for a year. Those doubters figured correctly: It was 2.3 percent. TRUMP: “Since my election, we’ve created 2.4 million jobs. And that number is going up very, very substantially.” – Davos speech. THE FACTS: Actually, job growth is going down. Looking at annual totals, rather than since the November 2016 election, U.S. companies and other employers added 2.1 million jobs in 2017. That was actually the lowest job growth in seven years. It’s not surprising that job gains are slowing, which typically happens when unemployment has fallen to very low levels and there are fewer people to hire. Right now, it is 4.1 percent, the lowest in 17 years. Still, Trump’s assertions that hiring is picking up is wrong. TRUMP: “The tax cut bill is expected to raise the average American’s household income by more than $4,000.” – Davos speech. THE FACTS: Most mainstream economists are skeptical of this figure. The average household will see its income rise $1,610 in 2018 because of cuts in income tax, according to the Tax Policy Center. The $4,000 figure refers to an estimate by White House economist Kevin Hassett that the cut in the corporate tax rate, to 21 percent from 35 percent, will lift household income by that much on average. This is based on the idea that companies will use their higher profits to invest more in machinery and other tools that will make workers more productive and therefore able to demand higher pay. That may happen, but it would take years to occur and most economists expect the benefit, if any, for most workers will be smaller. TRUMP: “The world’s largest company, Apple, announced it plans to bring $245 billion in overseas profits home to America. Their total investment into the United States economy will be more than $350 billion over the next five years.” – Davos speech. THE FACTS: This is misleading: It’s not clear from Apple’s statement that it is actually increasing investment in the U.S. from its current levels. Under the new tax law, the company is paying $38 billion in taxes on profits it held overseas – taxes it had previously avoided paying by keeping the money offshore. That’s included in the $350 billion. It also said it will continue to purchase goods and services from U.S. suppliers at its current pace, which would equal $275 billion over five years. Finally, it said it would invest $30 billion over the next five years in a new campus and other buildings, computers, and other equipment. Yet based on the company’s annual statements, it’s not certain this is an increase, either. The company doesn’t specify how much of its investment is in the U.S. and how much overseas. Apple invested more than $13 billion worldwide in 2017. Associated Press writers Christopher Rugaber and Calvin Woodward contributed to this report.